Sunshine Through the Rain: A year (plus a bit) in the making! A few stitches here and there while watching soccer, or sitting in traffic jams. Embroidering a whole block on the evenings my husband was out of town. Hand quilting while watching episodes of 'The Paradise'. This quilt has been a long but completely enjoyable process. The pattern is from the book 'S is for Stitch' by Kristyne Czepuryk. Initially I was following along with Liz's Stitch Along, but I couldn't even keep up with stitching a block a week and in the end just took it at my own pace. I used fabrics sent to me by the lovely Hydee, and added in a few of my own. I hand quilted using a light grey perle cotton. 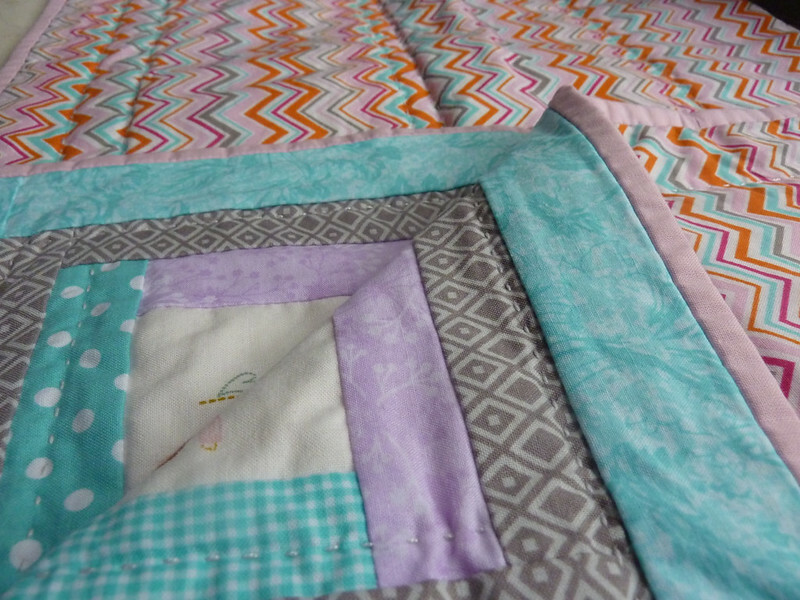 The backing is a fun chevron print and the binding is a plain Klona cotton. And then, thankfully, my sister had a baby girl and I knew this was the perfect gift for her! This is my fourth finish for the 2014 Finish Along Quarter 4. What an awesome gift for your niece, a true heirloom! Will your sister actually use it? If I received it as a gift I'm not sure I'd put a baby anywhere near it after so much work has gone into it - I'd be too scared to get bodily fluids on it. What a labour of love! I take my hat off to you for doing all that embroidery so beautifully. Congratulations! 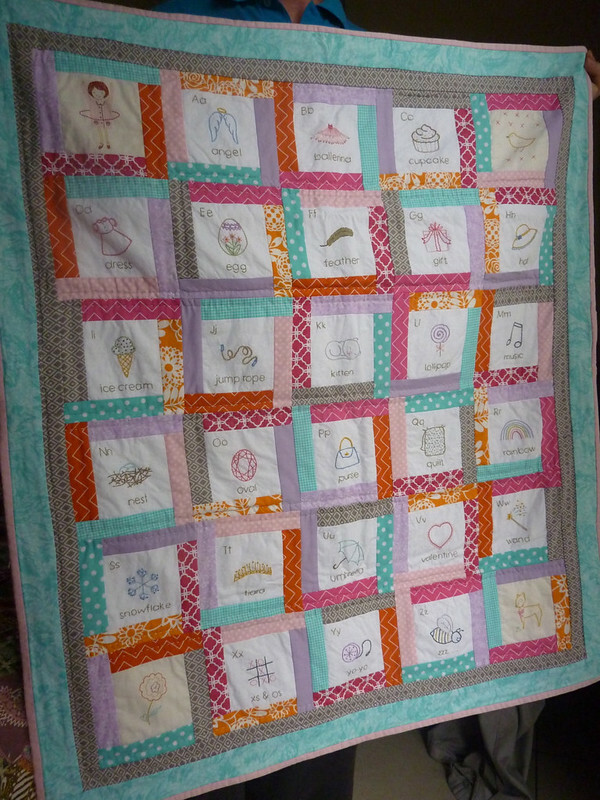 The quilt turned out so beautifully, and how wonderful that it is going to a great home to be used and loved. Its lovely. Well done Deborah! Congratulations on finishing this beautiful quilt!! Your niece will have such a special quilt to grow up with and love. Dayum, it's turned out gorgeous! I remember it from before and am still awed by your embroidery. Such a happy coincidence that it ends up in the family. What a sweet quilt! Love the embroidery and the colors you chose! Aw, so adorable! Your niece if very lucky to get such a beautiful quilt to cuddle with. Great job! 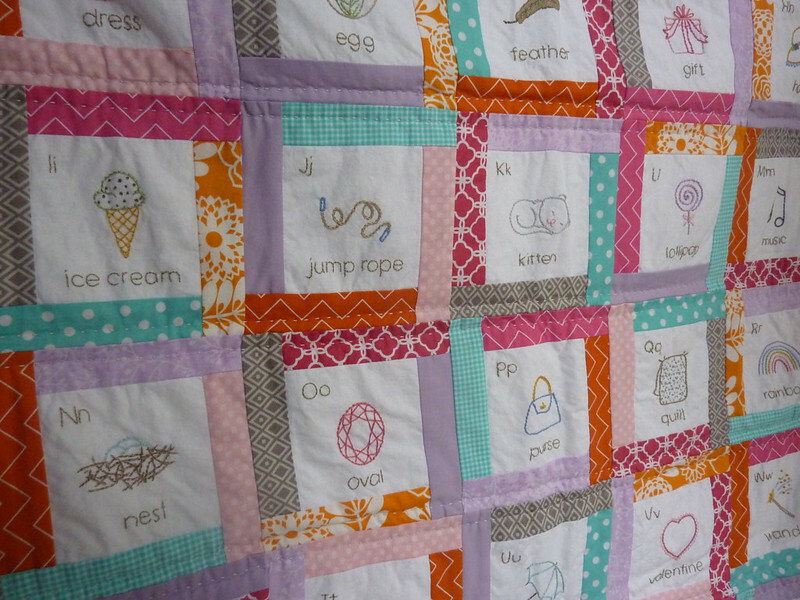 I love ABC quilts and this one is especially pretty! I love all of the embroidered blocks. Definitely a labor of love!! So perfect that it goes to a very special little one!! AAAdorable and such a great gift for your sister's baby girl, you put so much work into it and now you will know that it is going to someone who will really appreciate it, Beautiful. It is beautiful! It's like little treasure with all the work involved. Well done! Totally worth the wait! It is gorgeous and destined to be a family heirloom. It is absolutely lovely! The colours you've chosen for the borders are just a great compliment to the embroidery. What a very lucky little girl to have such a talented auntie! it's fantastic and what a special gift for your new niece! Adorable! I bet your sister loves it. 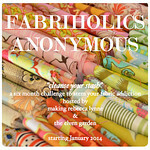 Last week, I was looking at a project one of my sewing group is working on and then I realised why it looked familiar. She is in the early stages of something like this too! It's beautiful Deborah! The perfect gift for a special family baby girl! Absolutely gorgeous Deborah! I'm sure your sister and niece will cherish it for a long time. Well done you for finishing! it looks fantastic and no doubt the niece and family are going to treasure it for a long long time!